This shop about bite size cheesecakes has been compensated by #CollectiveBias, Inc. and its advertiser. All opinions are mine alone. Holiday entertaining will start in force for me this week, hosting 2 parties this weekend and hosting another 2 later in the month. While I will be the first to admit I do get nervous when I entertain. However, it’s not that I won’t get the party accomplished it is getting everything else in my life taken care of while I plan these parties, ie, laundry, regular meals etc. Entertaining really is easy and should not be considered a chore. Not only am I sharing a great make ahead Holiday Dessert Recipe but also a holiday Planning check list to use at your parties this season and really throughout the year. 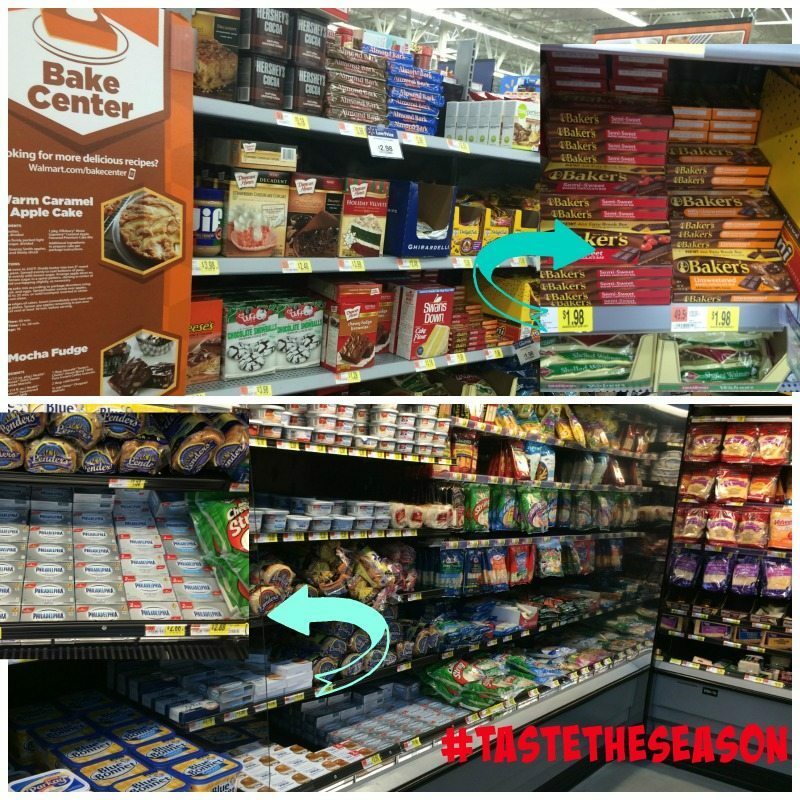 While shopping for supplies for my parties at Walmart, I was inspired by their many holiday baking displays. During the holiday season, there is an abundance of sweet treats available and it is so tempting to try all the different desserts. What better way to allow your guests to try an assortment of flavors than to make your dessert in bite size portions. 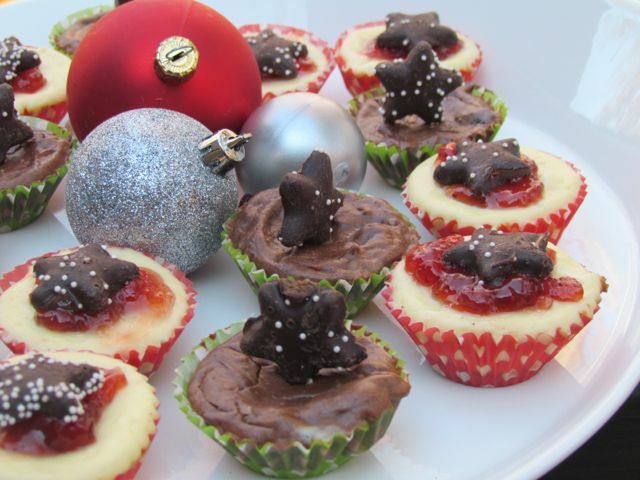 For one of our parties I will be serving these 2 bite Cheesecakes that can easily be adapted to different flavors. If the idea of cheesecakes intimidates you, this is definitely a starter cheesecake recipe to try. 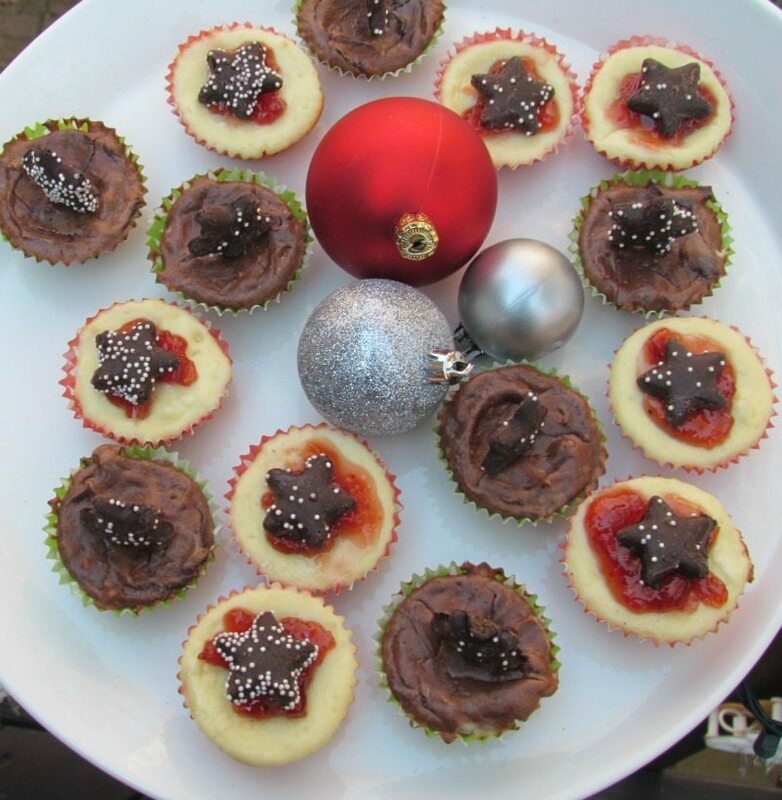 You don’t have a water bath, no worries about getting big cracks on top of the cheesecake, this are made in mini muffin tins and can be easily covered up with a variety of toppings. First make sure your ingredients, especially your cream cheese are room temperature before starting this recipe. I decided to make two different flavors for my platter but feel free to pick your favorite and make a whole tray. This recipe can easily be doubled, tripled etc. Each 8 0z of Philadelphia Cream cheese makes 12 bite size cheesecakes. After you have mixed the batter, split it in half. To one half of the batter, add melted and cooled semisweet chocolate ( used about 2 ozs for 8 oz of cream cheese. 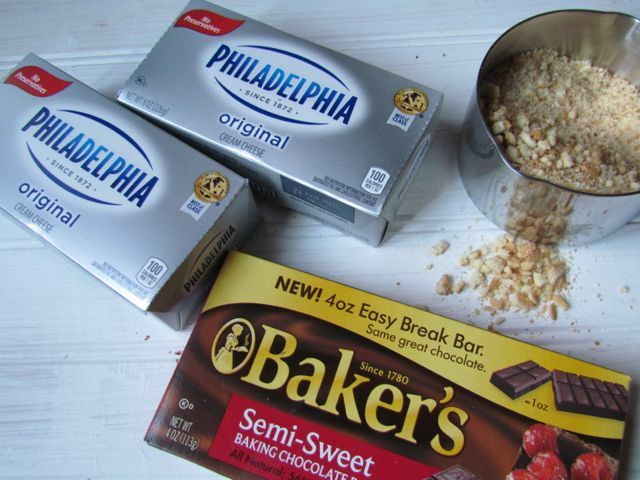 I like using Bakers Chocolate bars. Using a small ice cream scoop, fill each paper liner to the top with the batter. Bake and allow to cool completely. You can freeze them at this point and just take out the night before to defrost. Cheesecakes are best eaten at least 24 hours after they have been baked for the best flavor. Decorating them is up to you. Add flavored jams or small cookies to complete your theme. Now don’t worry if you are hosting your first holiday dinner party? Print out this Free Holiday Planning Entertaining List to help you stay organized. One of my favorite entertaining tips I have shared before is to always lay out your platters the night before. 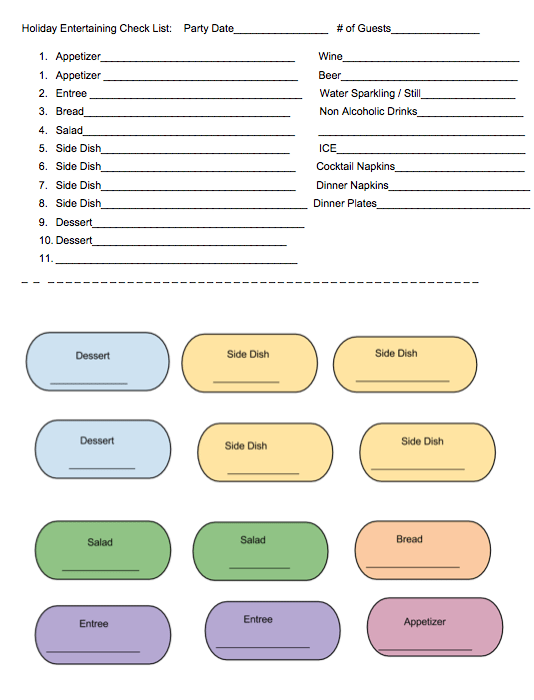 With this Holiday Planning check list you can cut out tags and place them on your platters so if you have help in the kitchen they can easily see where everything goes. If you need more inspiration, check out the Cooking Up Good website. It has recipes, sweepstakes, loyalty programs, coupons and more! What’s not to love? If you’re looking for a new dinner idea or a chance to win some awesome prizes, be sure to check it out! The perfect bite size cheesecake dessert. You can change up the recipe to make the flavors of your choice. Mix the graham cracker or cookie crumbs and butter together until evenly mixed. The mixture will not appear wet but come together when touched. Line a mini cupcake tin with 12 paper liners. 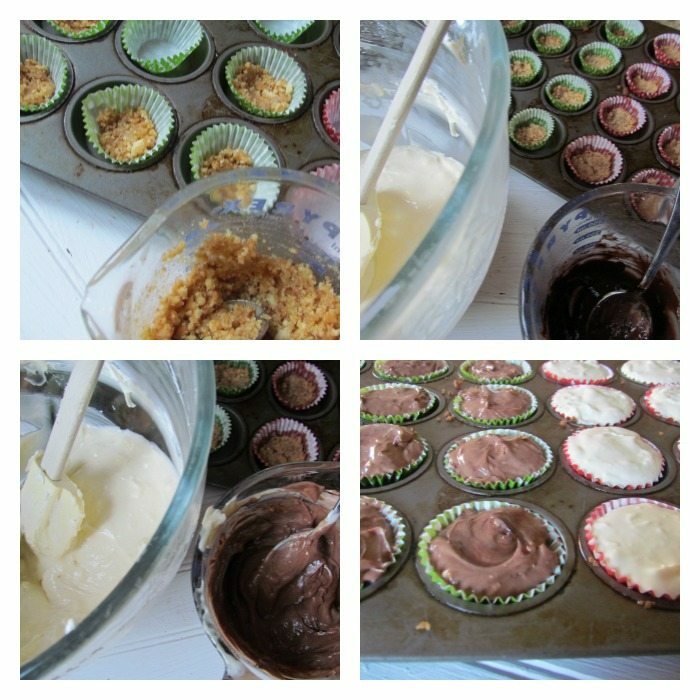 Scoop one level teaspoon of crumb mixture into each lined tin cup. Using your fingers or the flat side of a bottle, firmly press down the crust mixture into a flat hard layer. Place the muffin tin in the oven and bake for 5 minutes. While the crust is baking, combine the cream cheese and sugar in a mixer or a bowl. 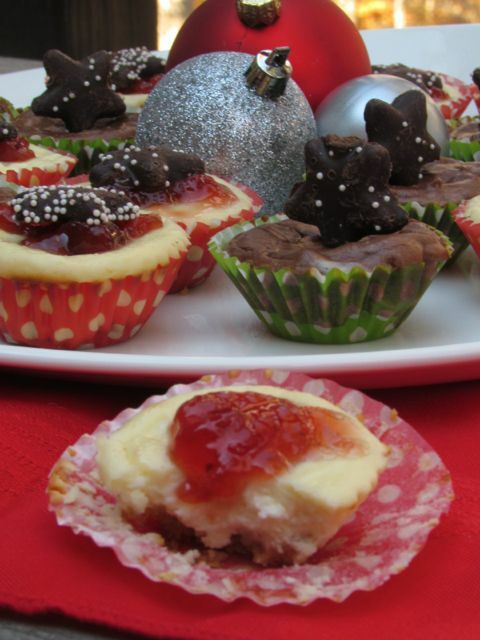 Make sure the cream cheese is soft, otherwise your cheesecakes will have lumps. Using a stand mixer or a hand mixer, cream the cream cheese and sugar together for one minute. Add the egg, lemon juice,(if using) and the vanilla extract. The mixture should be smooth and the texture should be like cake batter. After the crust has baked for 5 minutes, remove the tin from the oven and evenly fill the cups with the cheesecake batter. Using a small ice cream scoop is easiest. Bake the cheesecakes for 16-18 minutes until the center is slightly firm to touch and not jiggly. Do not worry if the tops appear to have a dome shape or are cracked. Remove the cheesecake from the oven allow the muffin tin to rest or 10 minutes. Place them on a plate in the freezer for 30 minutes until they are no longer warm and slightly cool. Carefully remove the paper liners from each mini baked cheesecake if desired. Top each cheesecake off with a 1/2 teaspoon of your favorite fruit spread or jam. For Chocolate, while the crusts are cooking melt 2 oz of chocolate in the microwave and allow to cool to room temperature. Add to the cheesecake batter. So what are you waiting for, start planning your #TasteTheSeason Holiday Party. What flavor Mini Cheesecakes will you make? 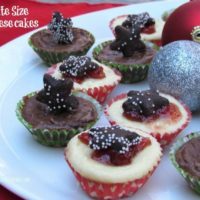 I am a cheesecake fanatic and I love trying new recipes, so I think I will give these minis a try. Bite size cheesecake! Love it! You can pack them in lunches. OK so now I am really jealous. I want some of these cheesecakes as well. This sound delicious I might just have to try and make some. I love this idea, it would be perfect for my boys. You always come up with the cutest goodie ideas. Oh I just love cheesecake and these bitesize ones won’t last too long at my house. Love them! I love bite-sized treats. Those are perfect for nipping a sweet tooth in the bud without overindulging. I love cheesecake and having them bit size is really awesome! I adore cheesecake, but I often find it served in pieces that are much too large. So these bite size ones are perfect! Those look amazing! And the fact that they’re bite size means I can eat a whole plateful! Love the smalll ones. That is a great idea. I think I would love these with orange marmalade! I’m a huge fan of chocolate and orange. And I’ve already printed your checklist! Oh my goodness! These look so yummy! I want one! And I love that they are so small unlike the normal cheesecake slices because then you can feel better about having a smaller portion. Hehe. Those are really cute! I like how they are individual sizes too! Yummy Amy I want Caramel too. I think I would make some peppermint, or caramel cheesecake. 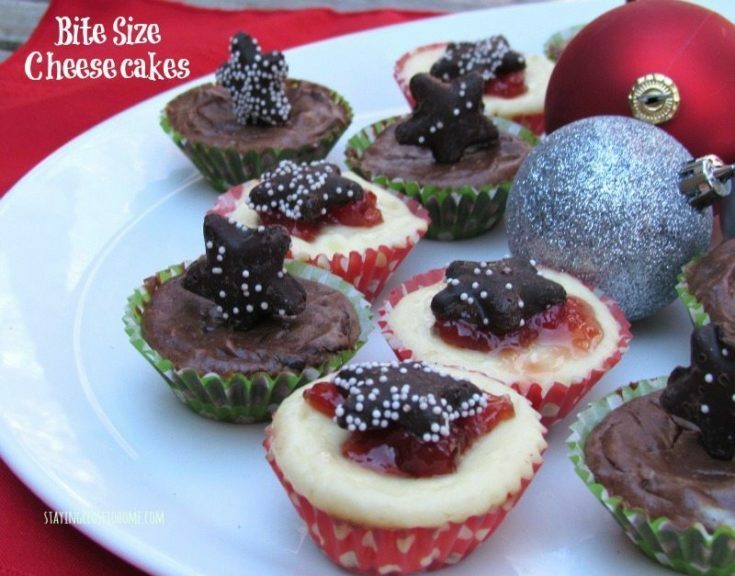 These look like great desserts for parties too! Oh my goodness, these look and sound so tasty! I especially like that they’re bite-sized because that just means I can have several instead of just one, right? I would probably eat the whole bunch myself. LOL. They sound so good.